In order to take advantage of the existing liquid handling and automation solutions for 96-well SBS formats, PolyAn is offering a range of functionalized multi-well products which are equipped with the same reactive surfaces as our glass and plastic slides. Standard polystyrene 96-well plates in different designs which are equipped with PolyAn’s 3D-Epoxy and 3D-NHS reactive matrices for covalent coupling of biomolecules. PolyAn’s multipart plates are comprised of a functionalized glass plate (75 x 110 mm) which is combined with the ProPlate superstructure after the printing process. ProPlate® MTP features a biocompatible, pressure sensitive, adhesive bonding system applied to a bottomless microtiter plate to form a leak-proof seal between wells to isolate microarrays printed on glass or plastic during processing. Designs are available in black polystyrene for the 96 well (round) and 384 well (square) plates, and in black polycarbonate for the 96 well (square) plate, which maximizes the array printing area. Application of the substrate is as simple as peeling off a liner to expose the adhesive and pressing the content to the surface. Alignment of arrays within the wells may be facilitated by means of a fixture (sold separately). This product is often customized for content providers seeking a go-to-market solution for their arrays printed on difficult to bond substrates. Lids and adhesive plate seals are also available both as a packaging solution to protect content and as a means to prevent evaporation during reagent incubation steps. ProPlate MTP products are compatible with several available microarray imagers and most robotic liquid handling platforms. 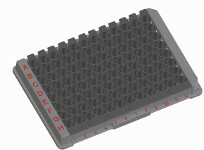 The HTA96-well plates of Greiner Bio-One have been specifically designed for microarrays. They are comprised of a low autofluorescence injection moulded plastic which PolyAn equips with our 3D-reactive surfaces. Please do not hesitate to contact us, if you would like to learn more about this novel design and/or if you would like to test some samples. Contact us if you require a special surface for binding of your biomolecules that is not listed in the products table. We can also functionalize other plate formats and substrates with our surfaces. Additionally, we have access to a wide range of different surface modifications for binding of small molecules, saccharides etc.